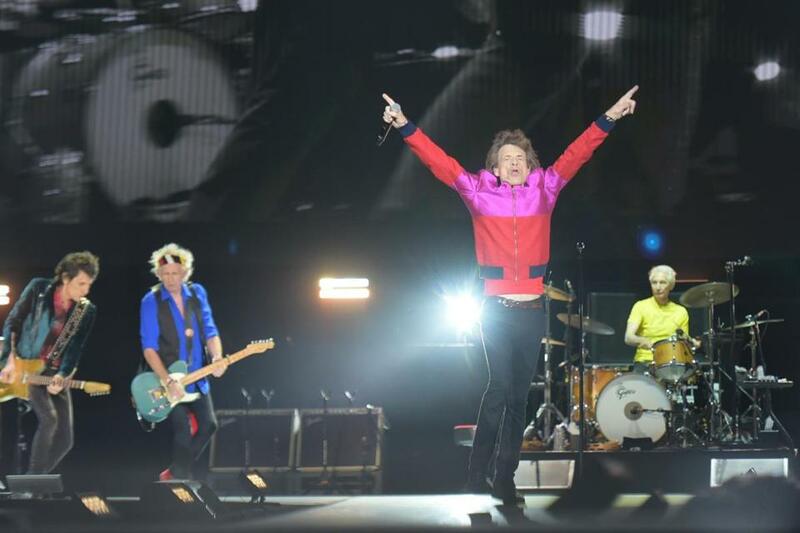 Rolling Stones members Ronnie Wood, Keith Richards, Mick Jagger, and Charlie Watts performing at the 2016 Desert Trip music festival on Oct. 14. Maybe that whole “You Can’t Always Get What You Want” thing isn’t true. It doesn’t seem to apply to Patriots owner Robert Kraft. Kraft, who’s worth an estimated $5.2 billion according to Forbes, is hosting an exclusive party Tuesday for friends and business associates that includes dinner and a private performance by the Rolling Stones at Gillette Stadium. Then there’s the matter of flying the World’s Greatest Rock and Roll Band to Foxborough. We presume Mick Jagger, Keith Richards, Ron Wood, and Charlie Watts don’t fly coach, so a private jet it is. And if it’s the Boeing 737 with the crimson lips-and-tongue logo that the band used on its 2015 tour, you’re talking about $20,000 per hour, says David Rome of Apollo Jets. “But if it’s just a Gulfstream for Mick and a bunch of the guys, that’d be between $6,000 and $10,000 an hour,” says Rome. Hotel rooms alone for the event — we’re told dozens have been booked at Boston’s posh Four Seasons — could cost tens of thousands of dollars per night. A conservative estimate would put the cost for lodging at about $50,000 nightly, including taxes, though the tab could easily reach into the six figures. There are 273 guest rooms, including 77 luxury suites, at the Four Seasons, with the least expensive rooms priced at $875, according to rates listed on the hotel’s website Tuesday. We’re guessing Mick and Keith probably don’t double up in one room. An “executive suite” goes for $1,145, but if you want a view of the Public Garden, you’ll shell out $1,245. And then there’s “specialty suites,” such as the 900 square-foot “state suite,” with views of Boston Common and the State House. That costs $3,700 a night. The 1,200 square-foot “garden suite” costs $5,400 a night. The “ambassador suite,” which is 1,700 square feet and has view of the Public Garden, costs $6,990. The “presidential suite,” overlooking the Public Garden from the hotel’s sixth floor, is priced at $12,000 a night — and it’s booked Tuesday night, a sales agent told us.